a new gift from Santa? 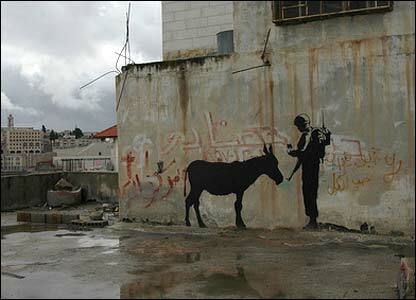 The mysterious and controversial graffiti artist from Britain know as Banksy has left new presents on the West Bank barriers in the original “Christmas City” (not my hometown of Bethlehem, a.k.a. Christmas City USA). 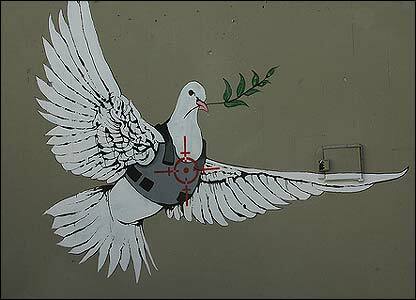 BBC news featured his latest works – a laser scope aims at a bullet-proof vest befitted dove, an Israeli soldier checking a donkey’s ID, his trademark rat with a slingshot, a young girl frisking a soldier. It’s not hard to imagine that his work has provoked many, regardless of their affiliation. 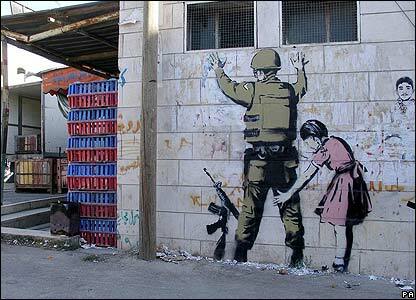 Banksy is a member of 30+ artists who joined together for Santa’s Ghetto 2007, which they identify on their website, as the “world’s most low-concept art event.” They encourage prospective visitors to come witness the show, saying that chances of getting randomly stabbed are more favorable than last year. Santa’s Ghetto 2007 is like the Dada Manifesto. War brings them together. They express through forms of irony and provocation. They are anti-establishment. Graffiti. It’s cheap. It’s illegal (or frowned upon at least). It’s public and accessible (at least in theory). Where do they stand? Graffiti is cool, or at least it was. Sotheby’s got over 102,000 pounds for a Banksy last February, and yet his identity remains hidden. He is the termite viewed as a white elephant – the anti-artist gone awry. 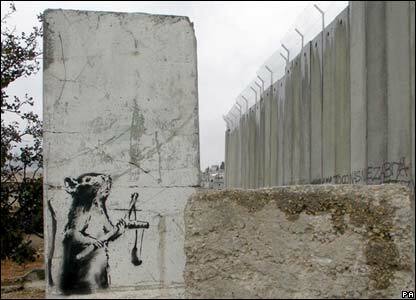 Here’s the link to a video about last year’s Santa’s Ghetto Banksy. From the Santa’s Ghetto site. The Point. Bethlehem is one of the most contentious places on earth. Perched at the edge of the Judaen desert at the intersection of Europe, Asia and Africa in the state of Palestine it was governed by the British following the collapse of the Ottoman Empire. After World War II the United Nations voted to partition the region into two states – one Jewish, one Arab and there’s been fighting ever since. It’s obviously not the job of a loose collection of idiot doodlers to tell you what’s right or wrong about this situation, so you’re advised to do further reading yourself (this month’s National Geographic has an excellent article all about Bethlehem). We would like to make it very clear Santa’s Ghetto is not allied to ANY race, creed, religion, political organization or lobby group. As an organisation the only thing we’ll say on behalf of our artists is that we don’t speak on behalf of our artists. This show simply offers the ink-stained hand of friendship to ordinary people in an extraordinary situation. Every shekel made in the store will be used on local projects for children and young people. Not one cent will go to any political groups, governmental institutions or, in fact, any grown-ups at all. Salaam. FOLLOW UP (12.9) – I just read this post about the fact that a NYC gallery faked the “first” Banksy show in New York. The article affirms that the Holy Land is the place to find him.